Ferroelectric materials (switchable spontaneous electric polarization under an external electric-field) are also piezoelectric (convert mechanical energy into electric energy) and pyroelectric (convert a temperature change into electric energy). The combined properties of memory, piezoelectricity, and pyroelectricity, make ferroelectric materials useful for many applications, e.g., energy harvesting, photovoltaics, sensor applications, medical ultrasound, infrared cameras, ferroelectric random access memory for computers, nonlinear-optics, and many others. LiTaO3 is an important nonlinear optical material with excellent photorefractive, nonlinear, and electro-optic effects, and ferroelectric and piezoelectric properties. The ferroelectric bulk crystals are widely used in optoelectronic devices. Indeed, along with LiNbO3 and KNbO3, LiTaO3 is among the most important lead-free ABO3 ferroelectric materials. 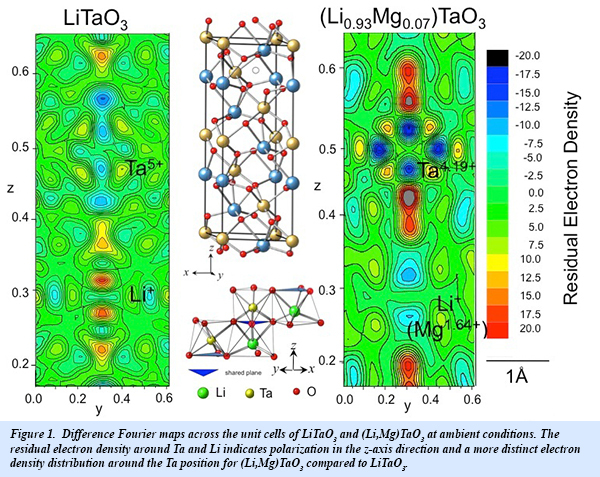 LiTaO3 crystals with Mg-doped stoichiometric compositions have been used to handle higher power/energy quasi-phase matching applications, especially for high power second-harmonic light generation. Application of pressure can tune the physical properties of materials and may introduce new phenomena. In this study, EFree scientists along with colleagues from Osaka University employed single crystal x-ray diffraction, powder diffraction, and Raman scattering to study the behavior of LiTaO3 and Mg-doped LiTaO3 under pressure. Accurate measurements of x-ray diffraction intensities provided detailed information about the bonding in these materials (Fig. 1), with the transitions and general properties confirmed by Raman data. 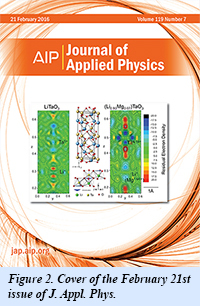 The paper was featured on the cover of the February 21st issue of J. Appl. Phys. (Fig. 2) [T. Yamanaka et al., J. Appl. Phys. 119, 075902 (2016)].